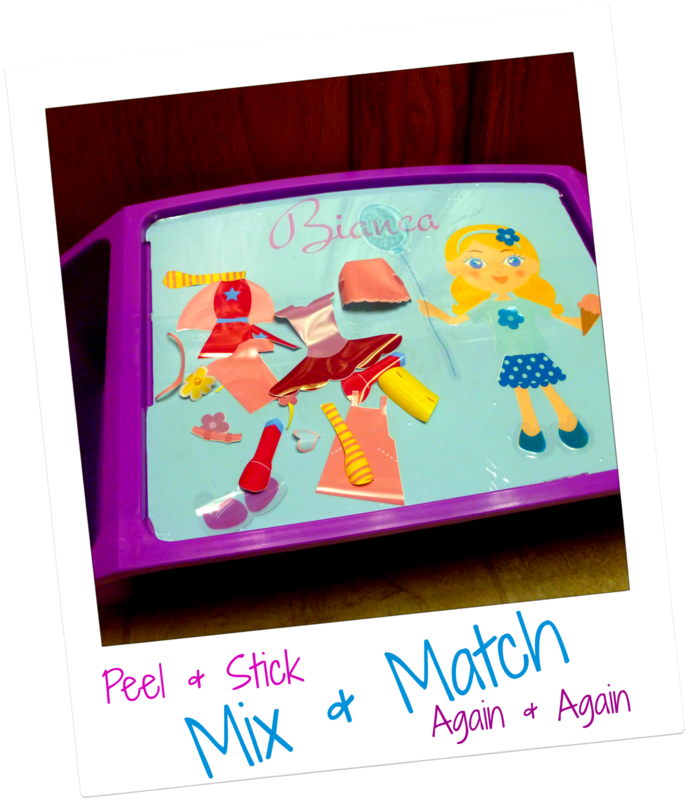 Near Normalcy: Giveaway: Fashionista Play Tray and other things I make for my kids just so I can play with them myself. 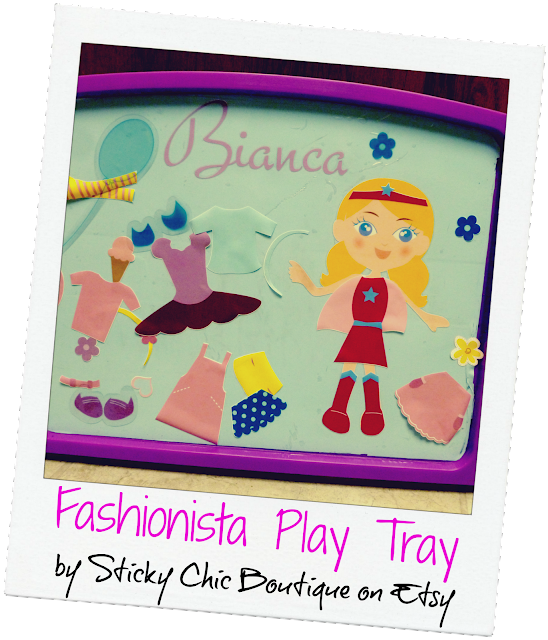 Giveaway: Fashionista Play Tray and other things I make for my kids just so I can play with them myself. I make a lot of cute stuff. I'm not bragging. It's just a fact. And I make a lot of it for myself, because I deserve it. I have like, 4 tumblers. And I have vinyl on my walls and my car. And I make a TON of it for my kids. When you browse my Etsy shop, you may notice many of the sample photos are items personalized with the names Jack and Bianca. This is not a coincidence. After I made Jack his Vroom Vroom Play Tray, I started brainstorming ways I could make his sister something similar. And here's what I came up with. I have to say this is my very favorite thing I have ever made. It is so much fun, both to make and to play with. It's a paper doll! Made of vinyl! On a tray! And it's amazing! The Fashionista's outfits are made of paper-thin static cling vinyl that stick firmly to the vinyl coating on the tray, then peel off to be reused again and again and again. The Play Tray sells for $29.99 and comes with enough mix and match pieces to make over a dozen outfits, including 3 dresses, 3 skirts, 3 tops, 3 pairs of shoes, a pair of tights, 7 hair accessories, an ice cream cone, and a balloon! And just like Barbie, she'll have lots more outfits. UNLIKE Barbie, her outfits are easy for even the littlest hands* to put on and off all by themselves. My 6-year-old still comes to me for help zipping up Barbie's dress. Usually because the dress is too skanky small for Barbie's body. How does that happen? Does Barbie put on weight after you bring her home? Do her clothes shrink in the DreamHouse dryer? Anyway. I've gone out of my way to make sure the Fashionista's outfits are not only easy for kids to use, but also child-appropriate. I wanted my daughter to have a fashion doll that looks like her: an innocent, beautiful, fun-loving child. Her clothes are fun, trendy, and cute, but still totally age-appropriate. I have lots more sets coming soon: Birthday party! Costumes! Princess dresses! Sports! I ran a poll on Facebook for ideas; keep them coming in the comments! That's what's so fun about Sticky Chic: I love custom work. I can bring YOUR ideas (or your little one's ideas) to life. Your Fashionista Friend can be a cowgirl, a superhero, a firefighter, a doctor, or an astronaut! She can be a cupcake baker or a princess or a bride or a police officer. She can hang out at the beach or on a farm or on the moon. I even plan to offer custom listings for this Play Tray. Want to surprise your little one with a special outfit, along with a mini-version for her Fashionista Friend? No problem. Shoot me a photo and I'll recreate any outfit (any toy, any pet, anything) in vinyl. I'm not sure if you can tell, but I'm kind of excited about this item, you guys. So excited I think I'll GIVE ONE AWAY. I love all my international friends, but the contest is open to U.S. residents only. If you're international I hope you'll still follow @StickyChic and/or @NearNormalcy on Twitter (spoiler alert: they're both me!) and we can totally be friends. That's almost as good as a prize, right? *The Fashionista Play Tray does include small parts that may prove hazardous for munchkins who still like to taste their toys. Not recommended for children under 3. A warning to my laundry.